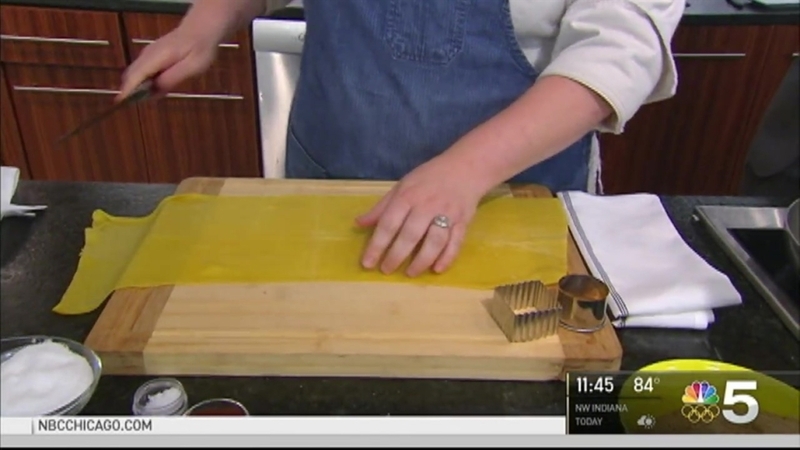 In NBC 5's countdown to Chicago Gourmet, chef Sarah Grueneberg stopped by Café 5 to show how to make the perfect summer pasta from her West Loop eatery, Monteverde. In the bowl of a food processor, quickly pulse the caponata and ricotta together until smooth. Remove and place in a medium sized mixing bowl. Fold in the breadcrumbs and pecorino romano until well combined. Fill a pastry bag fitted with a round tip with the eggplant mixture. Mound the flour on a wooden board or work surface. Make a well in the center and add the whole eggs and egg yolks. Using a fork, gradually fold the flour into the eggs, adding the water little by little until you have a soft dough. Knead a few times until smooth, then form the dough into a ball, wrap in plastic and refrigerate for 1 hour. After the dough has rested, roll as needed.